But what if there was a way of combining the personal service and attention that we used to receive, with the state of the art medical care that is now available. Wouldn’t that be the best of both worlds? When they set up in 2013, Concierge Medical had this ambition firmly in mind. They wanted to provide a comprehensive private GP service that delivers high-quality modern medicine but in a very traditional way – and that’s what they do. It boils down to three things – promptness, convenience and personal care. Promptness means that when you are ill a doctor visits you the same day, the day that you call them. It also means that if you need tests or need to visit a specialist, it is handled quickly and efficiently – you don’t wait weeks for results or follow-up appointments. Convenience is simple, it means you see a doctor in your home (or office if you prefer) at a time to suit you. No ifs, no buts. Personal care means you have your own GP, you see the same doctor each time. The doctor spends time with you and because there is no rush to see the next patient, a relationship built on continuity, trust and understanding is established. And all of this is delivered without compromising on the quality of medical advice and expertise. And if proof were needed that their service is of the highest standards, Concierge Medical passed the most recent Care Quality Commission inspection (January 2018) with flying colours. With a doctor to patient ratio lower than any other practice and with a limit placed on membership to ensure quality of care is maintained, it is not surprising that more and more people in the Cotswolds and surrounding areas are finding Concierge Medical to their liking. So much so, that since the beginning of 2018, Concierge Medical has recruited 3 more doctors and now tend to the needs of over 1,000 individuals and families across the Cotswolds, Oxfordshire and Warwickshire. There are very few people who don’t think it is important to find a plumber or a builder or an electrician who can be trusted to do a good job. But when it comes to personal well-being we have, for the last decade, been conditioned to accept second best, a service where; we wait weeks for an appointment, we rarely get to see the same doctor twice, we tolerate long delays in getting test results and we accept that a ten minute consultation is sufficient to discuss important health care issues. Clearly it doesn’t have to be this way. 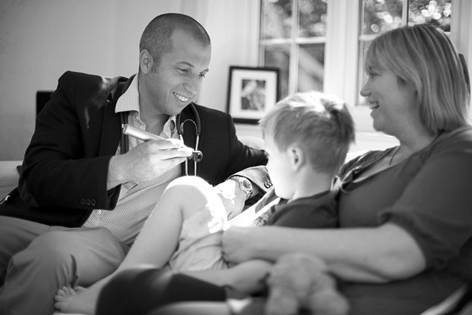 The innovative service delivered by Concierge Medical has successfully reinvented the GP model. By providing high quality, convenient private doctor services in a traditional way to homes and offices in the Cotswolds, Oxfordshire and Warwickshire, Concierge Medical are making it easier for the local community to efficiently access health-care and enjoy a better quality of life.